We live in the Age of the Applications, more popularly referred to as apps. And when it comes to safety on the job site, this is a very good thing. When you’re working in the hot hot heat, safety has to come first. There’s no project or work task more important than your health. There are many preventative measures you can take to protect yourself from getting heat stroke, such as taking breaks in the shade, staying hydrated, and wearing the right clothing. And now, there’s an app for that. OSHA has developed an App for iPhone, Android, and Blackberry called the Heat Safety Tool, which gives you vital safety information available whenever and wherever you need it, right on your mobile phone. 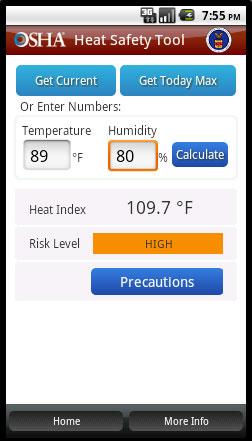 With this heat safety app, workers and supervisors can calculate the heat index for their specific worksite, and based on that information, the OSHA app will display the correct Risk Level for outdoor workers. After that, a simple click will issue reminders about the necessary protective measures that should be utilized to protect you and your co-workers from heat-related illnesses. It will give you reminders about making sure you drink enough fluids, it will remind you to schedule rest breaks, it will give recommendations for adjusting work operations, and how to gradually build up the workload for new workers. It will even give training on illness signs and symptoms, tell you how to monitor your co-workers for the signs and symptoms of heat-related illness, and offer you instructions to plan for knowing what to do in an emergency. The informed worker is the protected worker. So download this highly useful app and keep yourself informed and protected. Working Person’s Store carries heat-related personal protective equipment and various cooling products to help keep yourself and your workers cool in extreme heat. Remember to take these precautions, heat-related injuries are no joke and can often lead to serious or fatal injuries.